Livestock being taken off the ferry. 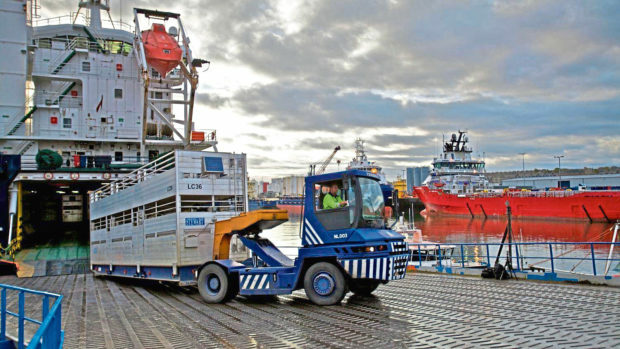 With the tender deadline for the Northern Isles ferry contract fast approaching, Aberdeen and Northern Marts (ANM) has highlighted the importance of the NorthLink Ferries service to the north of Scotland’s agricultural industry. The eight-year contract for routes between mainland Scotland and Orkney and Shetland – worth an estimated £370 million – is expected to be awarded in the summer. There are three companies bidding for the contract including the incumbent Serco, CalMac Ferries and German ferry operator, Förde Reederei Seetouristik (FRS). In 2018, NorthLink Ferries shipped more than 132,000 sheep and 24,000 cattle, while 2017 saw more than 526,000 lane meters of freight shipped – the equivalent of nearly 39,000 articulated trailers. The ferry service is vital for many island farmers and their businesses. Father and son, Ally and Jim Flaws, from Ringesta Farm, Quendale, Shetland regularly ship their cattle and sheep from Lerwick to Aberdeen to be sold in the ring at ANM’s Thainstone Centre, near Inverurie. The Flaws run a 35-cow herd of Limousin cross and Salers cross cows, and a flock of 350 breeding ewes. Serco NorthLink Ferries employs locals in the areas that they operate in, and Jim works part-time as a yardsman and livestock handler at the Lerwick port, particularly during the busy period from August to October. Jim said: “The service from NorthLink Ferries for shipping livestock is the best service we have ever had. It’s a lot cheaper than the previous service, particularly when shipping sheep, and it’s exceptionally reliable although we do have to compete with the weather quite a lot. Livestock is transported in state-of-the-art containers under strict welfare requirements, and the company is continuously monitored by Animal Health (APHA) and local council Environmental Health departments. Vets regularly travel with the animals on-board the vessels, on scheduled and unscheduled inspections, and animals are regularly monitored by members of the crew who are fully trained in animal welfare and handling. Jim also pointed out the excellent lairage facilities at Thainstone and the good service they have had from the company over the years. “ANM provides a very important service for Shetland farmers,” said Jim. “Our cattle forward for a Friday store sale travel to Aberdeen on a Wednesday and are in Thainstone for Thursday morning where they are very well looked after resting in lairage before being sold, and the facilities are first class. John Angus, head of livestock at ANM said: “We have a strong working relationship with NorthLink Ferries and are delighted with the high standard of service they deliver to our members and customers shipping cattle, sheep or ponies from the Orkney and Shetland Isles to Thainstone.